Home Article archives Celebrate Yoga Awareness Month! Check out the benefits of practicing yoga to celebrate Yoga Awareness Month. In honor of National Yoga Awareness Month, we want to help you spread the joys of yoga. September is the perfect month for beginners and advanced yogis alike to enjoy yoga. The crisp air and warm days make the perfect combination for a calm session. Across the nation, yoga studios and classes list events and festivals for everyone to enjoy during the month of September. Check out the office site here. 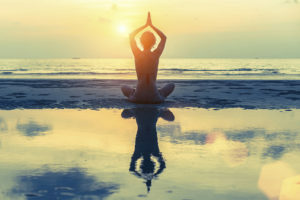 Keep (or develop) your Zen by learning about the benefits of yoga! Yoga makes you happier. The positive benefits stay with you much longer than the duration of a class or your own practice. This feeling carries you throughout the day. You won’t get bored. There are so many different types of yoga to enjoy! From Bikram yoga to hot yoga, try them all to find your favorite. Yoga is affordable. If you’re on a budget, all you need is a good yoga mat, a space to call your own, some water, and a good DVD (or app). You don’t have to spend a fortune to do yoga on the beach at sunrise! Everyone can enjoy yoga. Young and old – everyone can feel the benefits of practicing yoga. Besides making you feel better, yoga will build your strength, flexibility, all the while decreasing stress. Yoga balances your body and mind, while giving you the workout that can keep you lean. Remember: Practice makes perfect. When you first start practicing, you may feel uncomfortable and inflexible. Give it time and be open to further practice to reap the full benefits. Whether you practice once a month or daily, be sure to make the most of your yoga session to tone up, get limber, and clear your mind! From the professionals at Bell Black Insurance, we hope that you enjoy National Yoga Month! For all of your insurance needs in Rexburg and surrounding cities in Idaho, contact us today.